AIRWAY HEIGHTS Inmate dog handlers in the Airway Heights Corrections Center (AHCC) Pawsitive Dogs program had a rare opportunity to meet the woman who helped bring animal training programs to prisons all over the nation. 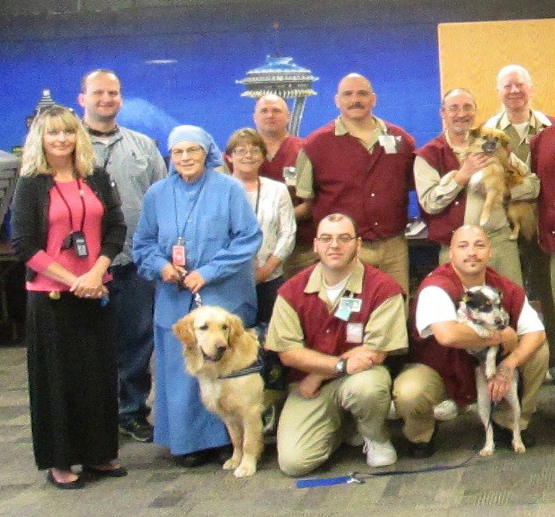 Sister Pauline Quinn, founder of the Prison Pet Partnership, visited AHCC May 5 to observe the Pawsitive Dogs program and offer suggestions to help the program grow. During the visit, she also met the program’s inmate dog handlers and spoke to them about about how their work impacts the field of corrections. “The dog program allows offenders that are in the prison program to change their outlook on the world and themselves,” Quinn said. Quinn, a Dominican nun, started a program in 1981 that allowed shelter dogs to live with inmates in prison. The inmates provided daily care for the dogs and trained them to become service animals. The service animal training program began at Washington Corrections Center for Women (WCCW) in Gig Harbor and its success led to the launch of similar programs at prisons across the state. Several prisons also run dog adoption programs, which allow inmates to provide daily care, obedience and socialization training to dogs from local shelters who live with inmates in their cells. The goal of those programs is to make the dogs more desirable for adoption, while providing the inmates to learn basic animal husbandry skills. AHCC is one of nine Washington prisons that run dog adoption programs in partnership with animal shelters. Quinn’s programs have received wide national acclaim and have spurred the creation of similar programs in prisons across the United States, according to the Prison Pet Partnership website. Inmate dog handlers learn about the patience and hard work it takes to train a dog. The Pawsitive Dogs program allows offenders to learn the difference between enforcing compliance and helping the dog learn to make appropriate choices and allows offenders to see the “bigger picture” when making a training decision. Offenders learn that when training a dog, mistakes are a normal part of learning anything new. Learning from those mistakes is how we grow as trainers and people. Another important outcome of the program is it allows handlers to focus on their lives and see the world though others’ perspectives, according to Quinn. It also centers around positive reinforcement, which can minimize feelings of resentment that may be felt in prison. Quinn said it the program often inspires inmates to make changes in their lives and that they are proud of. They can use these skills to live healthy, productive lives once they reenter society. Brad Self, an inmate in the program, said he is an example of this. In addition to serving as a handler in the Pawsitive Dogs program, he taught himself to crochet sweaters for the dogs, which are given to their new owners when they are adopted. He said his experience with the dogs has taught him to look at a difficult situation with an optimistic perspective and that the program has had a positive impact in his life. Richard Atinson, another inmate dog handler, said the program allows inmates like himself to express themselves through positive communication in a productive learning environment. Following Quinn’s visit, inmates Jorge Sosa and Jeremy Medlin, who are “dog mentors,” shared how the program has enriched their lives. Dog mentors are inmates who have been in the program for more than six months and have trained at least three dogs. They use their experience to help train inmates who are new to the program. They said the experience of training dogs has left them feeling humbled and happy to be able to pass on the skills they’ve learned from the program to help others.